ARCADIA —Santa Anita Park will play host to the Japanese American community on Saturday, March 23, as the 18th running of the Grade III, $100,000 Tokyo City Cup for older horses at 1½ miles will be the centerpiece of a daylong assortment of cultural events and fare. The Tokyo City Cup is co-presented by Ohi Racecourse of Tokyo, home of Tokyo City Keiba, which has a friendship agreement with Santa Anita Park. TCK looks upon the American racing system, the home of dirt racing, as a role model and schedules all three triple crown races for 3-year-olds in the spring. Tokyo City Cup's mascot, Umatase-kun. 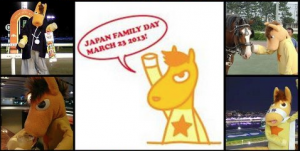 Japan Family Day was started as a way to introduce Japanese traditional culture and to interact with the people of Southern California. Through the years, it has become one of the most popular spring festivals in the area. — Taiko drum performances on the Grandstand apron. L.A. Matsuri Taiko will perform after the Tokyo City Cup. — Japanese Family Fun performances will include sado (tea ceremony), kado (flower arranging), shodo (calligraphy), shishimai (lion dance), and minyo (folk songs). — A Japanese Beer Garden. — Authentic Japanese cuisine, including sushi, okonomiyaki, curry rice, tea, and more. 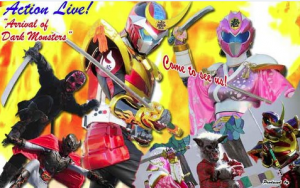 — New this year: Fujiyama Ichiban, who will perform an action hero show. Entries for the Tokyo City Cup will be Wednesday, March 20. For more information, visit www.tokyocitycup.com/ or call (805) 449-8726. Santa Anita Park is located at 285 W. Huntington Dr., Arcadia. Sado — 12, 1, 2 and 3 p.m.
Shodo — 10:30 a.m. to 5 p.m.
Origami — 10:30 a.m. to 5 p.m.
Omatsuri (Japanese traditional festival) — 10:30 a.m. to 5 p.m.
Kimono — 10:30 a.m. to 5 p.m.
Visit Japan (travel information) — 10:30 a.m. to 5 p.m.
Anime — 10:30 a.m. to 5 p.m.
Japanese food (sushi, curry, okonomiyaki, barbecue, tea, onigiri, baked goods, beer) — 10:30 a.m. to 5 p.m.
Kendo — 11:40 to 11:55 a.m., 2:25 to 2:40 p.m.
Tsugaru shamisen — 12 to 12:15 p.m., 2:45 to 3 p.m.
Sumo — 12:20 to 12:35 p.m., 3:05 to 3:20 p.m.
Minyo — 12:40 to 12:55 p.m., 3:25 to 3:40 p.m.
Fujima Ichiban (action hero show) — 1 to 1:20 p.m.
Shishimai — 1:20 to 1:40 p.m.
Ryukyu buyo (Okinawa traditional dance) — 1:45 to 2 p.m., 3:45 to 4 p.m.
Karate — 2:05 to 2:20 p.m., 4:05 to 4:20 p.m.
Kado — 10:30 a.m. to 5 p.m.
Pony rides and face painting — 11 a.m. to 3 p.m.